Not long ago I met Simon Gregory, creator of a new magazine called Zombie Training. It's a super cool survival guide in the event of a Zombie outbreak. It has everything, even some interviews with cast from The Walking Dead! 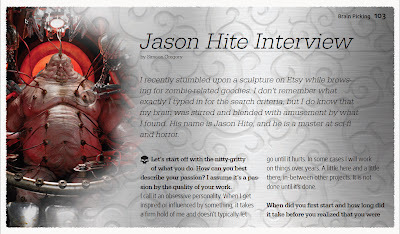 They also did an interview with me on my art. Like a lot of people, I've been on a Zombie kick lately, and it was a real pleasure trying to answer questions like, " What would be your number one weapon choice in a zombie epidemic"
You can see the Zombie training site here, and here is a link to get the 130 page magazine. Check it out!